If a frequent traveler to Thailand goes around the country today, a rapid rise in the prominence of Muslims will be noticed, stretching from Chiang Rai in the north of the country right down into the south of the country. Many of Thailand’s 6-7 Million Muslins are totally integrated into Thai culture and society, a country that takes great pride in its cultural homogeneity. However in the South of Thailand, many, if not most Muslims still live in close knit rural villages undertaking traditional activities such as rubber tapping, fishing, and rice farming. A distinct culture, different from the mainstream “Thai” culture has been able to nurture in the relaxed air of religious freedom in Thailand. Generally speaking, there is a great contrast economically between the rural Muslims of Southern Thailand and the rest of the community. The incidence of poverty among Muslims in Southern Thailand is high. To many Muslims however this is not considered a problem, as a simple religious based lifestyle is deeply valued and indeed is perceived to offer protection to the community from external “morally corrupting forces”. As a consequence many rural Muslim parents prefer to send their children to one of the hundreds of Islamic schools around the south of the country. Many, if not most of these schools are set up, owned, and staffed by the communities themselves providing an Islamic education, in addition to the primary and secondary school national curriculum. A few lucky students may get a place in the prestigious and well equipped Pondok Bantan in Nakhon Si Thammarat, founded by the recently retired Secretary General of ASEAN Dr. Surin Pitsuwan and his family, or one of the local Islamic Council schools, which are also relatively well equipped. Pondok Bantan has been generously funded by a number of Middle East sources, including the Islamic Development Bank, and even the Sasakawa Peace Foundation based in Japan. However the majority of Muslims must opt for one of the local schools set up by one of the members of the community. These local community schools operate with the minimal infrastructure and facilities. Classrooms are grossly inadequate, with poor libraries and few other teaching resources available. There is a drastic shortage of teachers for national curriculum subjects, often relying upon volunteers to assist. 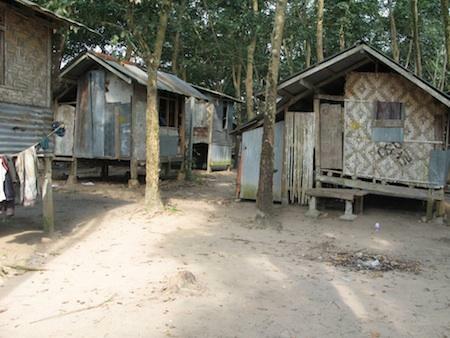 In the schools or “pondoks” where students are resident, students are often forced to sleep up to 10 students per hut, which is barely habitual and potentially a fire and disease trap. Many of these schools are overloaded with students and finding it difficult coping with the large numbers. The attitudes of the owners who in many cases are descendants of a Tok Guru or traditional religious teachers of small “pondoks” tends to be protective and conservative. Their prevailing vision tends to rather short with some exceptions, where small short term successes are sort, rather than spending money on long term development. They rather stick to the old “ways of doing things” and take pride in preserving tradition which is now out of context in today’s society. The aim of many schools is not about developing student integration within the community, but more about developing what could be called the “Islamization of knowledge”. Consequently any real progress is slow and doesn’t engage the rapid pace of change in society, where the schools become less competitive in long term. As national curriculum studies are of a low standard in the Islamic Schools, where failure rates are extremely high, little government funding is attracted in the competitive private school environment of Thailand. However, Islamic schools are still attractive to many parents as the very low fees, or no fees, lightens their economic burden, compared to other educational options. In addition to the above problems, a number of other problematic issues exist within these schools around Southern Thailand today. Firstly, the religious curriculum is set by local Ulama or religious scholars. The majority of Ulama themselves came through the “pondok” system and have little, if any trans-disciplinary or holistic educational experience. They tend to see the world the way that they were taught to see the world through their own education. This has led to great emphasis on Fard’ain (compulsory duties a Muslim must perform such as prayer) aspects of Islam, at the expense of Fard Kifayah (duty out in the world). This “narrow” approach to the holism of Islam may hinder student’s ambitions and abilities to integrate within mainstream Thai society. Secondly, it is very difficult to get any unified approach as Islamic leaders in Southern Thailand are fragmented and may even be competitive with each other, rather than cooperative. This leaves the community without any answers or any common approach towards problems. Due to the diversity of interpretation, there are very few safeguards against the infiltration of distorted and fringe views about the meaning of Qu’ranic texts. Although regional Islamic Councils have the responsibility to monitor religious teaching within their regions, there are no requirements for any teachers to conform to any agreed or centralized interpretation. If unchecked, religious schools and ‘pondoks” could become potential breeding grounds of deviant teachings, further isolating students from mainstream Thai society. For many of Southern Thailand’s Muslim youth, the “pondoks’ have become a refuge where students can drift in and out of society as they feel. Very few students ever get to a university, or acquire the skills to open a business. This tends to reinforce a separate identity rather than students encompassing the aims and values of the general community. The above is compounded by the generally poor standard of national curricula education. Students that complete their education within the Islamic school system are at great disadvantage to those who have attended secular schools focusing purely on the national curriculum. This generally hinders rural Islamic communities participating in the current economic growth and development going on today in Southern Thailand, thus widening the income gap and perpetuating relative poverty among Southern Thai Muslim communities. If this gap continues to widen, this may lead to some groups questioning the equity distribution of Thailand, which could potentially lead to some form of resentment, or allow other groups to take advantage of the situation through introducing new dogma into the community. However as of today there are no links with the fragmented insurgency groups in the troubled provinces of Pattani, Narathiwat, and Yala. This is fundamentally a separate and little acknowledged problem. Funding, and in particular the lack of grants and donations coming into these schools is causing immense hardships. In some “pondoks” the students have to buy and cook their own meals and build accommodation at their own expense. Yet, despite all the hardship, the students are happy and ever willing to stay at the school as long as they feel the need for a Muslim education. Islamic schools in Southern Thailand are neglected, and this is of particular concern when education is a major contributor to the capacity of any community to improve general wellbeing. With international agencies unaware or ignoring the problem, the gap in assistance has meant that schools are open to any potential benefactors who are willing to assist. One group that has moved into this vacuum is the Pakistan based Taliban, now funding a number of schools around the Southern provinces, where these funds are gratefully accepted. In addition, Islamic schools have not been successful in protecting youth from “morally corrupting forces”. Islamic schools have just been able to reinforce certain Muslim cultural characteristics, rather than develop deep Islamic identities. Government agencies are pushing harder to make sure the schools are keeping up with the standard. But a corrupted educational system, politics, the inertia of Thai culture, and in some cases negative sympathy towards neglected schools hinder standards enforcement, thus reducing Islamic schools general competitiveness even further. Many Islamic schools circumvent the standard enforcement process by documenting exaggerated school discipline, standard conformity, academic success to pass the official audits. So far there has been no appetite to take the educational QA process as an effective tool for improving sustainable educational quality. Some fault lies with the communities themselves. Islamic schools have become extremely competitive among themselves, destroying any potential for cooperation. More importantly there are many barriers for any leader to emerge and unify the community on matters of education. Ironically some have had the chance but not taken it, depriving the community with a voice and a will to evolve with the rest of society and advance Islamic education. As a consequence many Islamic communities look to their various community and religious leaders, leading to political fragmentation of the community. From a geopolitical perspective there doesn’t appear to be any link between donations from Taliban sources and any developing militant philosophy on the part of the schools. However, this issue shows up the problems that the US “war on terror” should be dealing with around the world, but is failing to recognize, let alone act upon. The war on terror can only be won through assisting in the education and development of Muslim communities around the world and not by drone warfare which is apparently the method of choice by the US administration today. What is happening in Southern Thailand shows a need for policy re-evaluation. There are large numbers of Southern Thai Muslims who would prefer a religious based education and this is a basic human right. However it is also important that the best possible well-rounded education is provided if Southern Thai Muslim youth are to be empowered to become citizens contributing to the communities they belong to. This is not calling for them to adopt the same growth paradigms other pursue, but rather seeing the need to empower today’s youth to participate in economic, social, and spiritual development the Islamic way. Without attention the students mind will be easily infiltrated by militant ideas, which Taliban is gradually doing. Development agencies must see this need before the potential problems outlined above fester into realities that will be much more complex to repair in the future. The Taliban may now understand that the battle for “hearts and minds” is an important facet of their international strategy. Note this is very different to their own domestic strategies. They have opened up philanthropy as a new front in the “war on terror” to nurture and win sympathy among the world Islamic community or Ummah. The above article could have been about the Indonesian pesantran, or religious boarding schools also. Money flows in from Saudi, in particular so we have an Arabization of the muslim faithful, I wouldn't mind betting similar is happening in Thailand. ^It has. I rember listening few years ago to the headmaster (muslim) of a thai state school in the deep south. he was talking about wanting to setup a seperate religious center in the school, but was having problems getting money from bangkok.... the issue being that he really didnt know how to ask correctly. he said that he could get saudi money right away, but it came on the condidtion that only saudi trained religious teachers would be employed..... People the headmaster believed did not respect or care about local culture. Really sick that the mussies kill the teachers that are just trying to help ALL, male and female to get an EDUCATION. It's even crazier that they beat one of the female teachers into a coma (she died later) and then the women of that village protected the so called men (really just animals) so that they would not be prosecuted. After over 5000 people have died because of them, they still can't get it into their heads that this is NOT the way to get things changed. Islamic education.....well there's your problem right there. a religious based education and this is a basic human right. An interesting conundrum- is it a basic human right? Freedom of religion certainly is. This question is not unique to Islamic schools, and not restricted to the 3rd and developing world- for example, in affluent Australia there are a number of religious schools including some of the orthodox Jewish variety which, along with fundamentalist Islam, want to teach their offspring not to adopt the norms of the broader society in which they live, or have much at all to do with it. Religious schools seem to think the state has the obligation to fund them just the same as secular schools with a nationally approved and uniform curriculum, but I and many others disagree. Same was happening a few years back in Cambodia, and some women started to wear veils etc which aren't traditional with the Cham Muslims. Basically, they wanted their relaxed version of Islam to become stricter. Saw something a month or two back which said the Cambodian government had put a stop to it when they realised what they were doing, how true it was I don't know but I hope it is - the Cham Muslims of Cambodia are decent people on the whole, much nicer than your Arab or South Asian cretins certainly. The muslims I've met in Asia have been mainly nice. Malays, Javanese, Yawi- I've had no problem with them, one on one- quite the contrary. It was Malay village life that originally sold me on Asia, and the good things about Asian village life (& I've been paying for it ever since ) . I daresay the yawi village life is pretty similar. Rather than propping them up and bombing their enemies, while they wallow in their enormous riches and disseminate their intolerant cult to otherwise tolerant people, we should really bomb the Sauds out of Saudi Arabia. They are not alone in being tyrants, but they are also bigots- rich, proselytising bigots at that, with a fraudulent family claim to religious significance, and virtue. While we prop them up and extract their oil, they use their money to undermine those things that we stand for. Last edited by sabang; 27-02-2013 at 11:21 PM. Couldn't agree more Sabang, but it might well be a case of better the devil we know, or at least that's how the governments assisting the House of Saud might see it. he said that he could get saudi money right away, but it came on the condidtion that only saudi trained religious teachers would be employed..... People the headmaster believed did not respect or care about local culture. The Muslim world is not united, and Wahhabism angers alot of other Muslims. It is ultraconservative and goes against alot of the ways of Islam in Southeast Asia. Wahhabi is so strong because the ruling house of Saud used Wahhabism to unite Saudi Arabia. I have watched the same thing going on for years in Africa. The Christian churches constantly asking their devotees for money at every service. Higer and higer charges for school fees etc. The priests park their new Mercs and Audis outside the church and live in luxury houses. Across the street is a Mosque which offers free education and assistance with housing. Handouts of basic food supplies and the Mullah lives the same basic life as his followers. Its not hard to see which God looks the more merciful if your family is struggling to survive. Up until only a few Centuries ago the Islamic world was recognised as the repository of the best knowledge in most, if not all, of the Arts and Sciences - Astronomy, Mathematics, Poetry, Medicine etc.. Sadly this wonderful past has been subsumed by a band of swivel-eyed, misogynist troglodytes (not all my own words) whose idea of "education" is to learn the Koran by heart, not debate it, not even discuss it really, simply learn by rote and accept it all. Education outside that is hated and even feared - simply because an educated man (or, God forbid, a woman) is capable of rational thought and likely to reject dogma or radicalism. It was more than a few centuries ago. Essentially prior to the reformation european christians were not much better than the wabbi boys in saudi. islam went though a similar process unfortunately for them the progressives lost out to the literalists and they have been going backwards ever since. I think islam is heading for a round two for ownership of the sole of islam; unfortunately with all that saudi money combined wiht the willingness to use violene and intimidation... I think the progressives will loose out, again, to the wabbi boys and things will get worse. Violence is the only way to get things changed, ask the vietnamese.